Cardiff (; Welsh: Caerdydd [kairˈdiːð, kaˑɨrˈdɨːð]) is the capital and largest city in Wales and the eleventh-largest city in the United Kingdom. 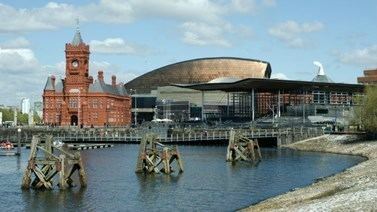 The city is the country's chief commercial centre, the base for most national cultural and sporting institutions, the Welsh national media, and the seat of the National Assembly for Wales. The unitary authority area's mid-2011 population was estimated to be 346,100, while the population of the Larger Urban Zone was estimated at 861,400 in 2009. The Cardiff metropolitan area makes up over a third of the total population of Wales, with a mid-2011 population estimate of about 1,100,000 people. Cardiff is a significant tourist centre and the most popular visitor destination in Wales with 18.3 million visitors in 2010. In 2011, Cardiff was ranked sixth in the world in National Geographic's alternative tourist destinations. Sporting venues in the city include the Principality Stadium (the national stadium for the Welsh rugby union team), Sophia Gardens (the home of Glamorgan County Cricket Club), Cardiff City Stadium (the home of Cardiff City football team and the Wales football team), Cardiff International Sports Stadium (the home of Cardiff Amateur Athletic Club), Cardiff Arms Park (the home of Cardiff Blues and Cardiff RFC rugby union teams) and Ice Arena Wales (the home of Cardiff Devils ice hockey team). The city was awarded the title of European City of Sport twice, due to its role in hosting major international sporting events: first in 2009 and again in 2014. The Principality Stadium hosted 11 football matches as part of the 2012 Summer Olympics, including the games' opening event and the men's bronze medal match. 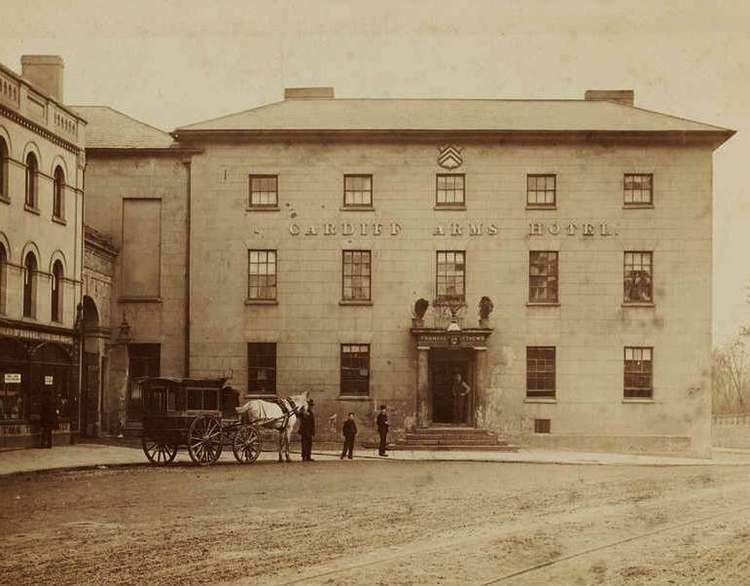 Caerdydd (the Welsh name of the city) derives from the earlier Welsh form Caerdyf. The change from -dyf to -dydd shows the colloquial alteration of Welsh f [v] and dd [ð], and was perhaps also driven by folk etymology (dydd is Welsh for 'day' whereas dyf has no obvious meaning). This sound change had probably first occurred in the Middle Ages; both forms were current in the Tudor period. Caerdyf has its origins in post-Roman Brythonic words meaning "the fort of the Taff". The fort probably refers to that established by the Romans. Caer is Welsh for fort and -dyf is in effect a form of Taf (Taff), the river which flows by Cardiff Castle, with the ⟨t⟩ showing consonant mutation to ⟨d⟩ and the vowel showing affection as a result of a (lost) genitive case ending. 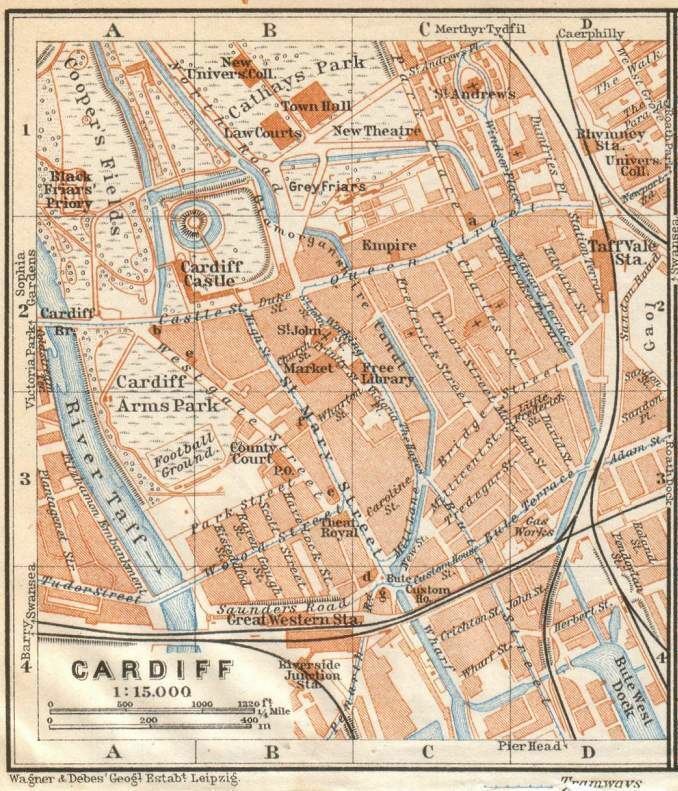 The anglicised form Cardiff is derived from Caerdyf, with the Welsh f [v] borrowed as ff , as also happens in Taff (from Welsh Taf) and Llandaff (from Welsh Llandaf). As English does not have the vowel [ɨ] the final vowel has been borrowed as /ɪ/. Until the Roman conquest of Britain, Cardiff was part of the territory of the Silures – a Celtic British tribe that flourished in the Iron Age – whose territory included the areas that would become known as Breconshire, Monmouthshire and Glamorgan. The 3.2-hectare (8-acre) fort established by the Romans near the mouth of the River Taff in 75 AD, in what would become the north western boundary of the centre of Cardiff, was built over an extensive settlement that had been established by the Romans in the 50s AD. The fort was one of a series of military outposts associated with Isca Augusta (Caerleon) that acted as border defences. The fort may have been abandoned in the early 2nd century as the area had been subdued. However, by this time a civilian settlement, or vicus, was established. It was likely made up of traders who made a living from the fort, ex-soldiers and their families. A Roman villa has been discovered at Ely. Contemporary with the Saxon Shore Forts of the 3rd and 4th centuries, a stone fortress was established at Cardiff. Similar to the shore forts, the fortress was built to protect Britannia from raiders. Coins from the reign of Gratian indicate that Cardiff was inhabited until at least the 4th century; the fort was abandoned towards the end of the 4th century, as the last Roman legions left the province of Britannia with Magnus Maximus. A town grew up in the shadow of the castle, made up primarily of settlers from England. Cardiff had a population of between 1,500 and 2,000 in the Middle Ages, a relatively normal size for a Welsh town in this period. It was the centre of the Norman Marcher Lordship of Glamorgan and by the end of the 13th century, Cardiff was the only town in Wales with a population exceeding 2,000, although it remained relatively small compared with most notable towns in the Kingdom of England, and continued to be very much contained by its walls, which has begun as a wooden palisade in the early 12th century. It was none-the-less of sufficient size and importance to be awarded a series of charters, notably in 1331 by William La Zouche, Lord of Glamorgan through marriage with the de Clare family, Edward III in 1359, then Henry IV in 1400, and later Henry VI. In no small part due to the historic Anglicisation of the town, in 1404 Owain Glyndŵr burned Cardiff and took possession of the Castle. As many buildings in the town were made of timber, and tightly packed together within the town walls, much of Cardiff was destroyed. Ironically given the treatment of Cardiff by Glyndwr, a statue of him was erected in Cardiff Town Hall in the early twentieth century, reflecting the complex and often conflicting cultural identity Cardiff has as the capital of Wales. However, the town was soon rebuilt on the same street plan and began to flourish once again. In additional to serving an important political role in the governance of the fertile south Glamorgan coastal plain, Cardiff was a busy port in the Middle Ages due to its location on the Bristol trading routes, and was declared a Staple port in 1327. This furthermore led to the town gaining a reputation for piracy, which by the Early Modern period led to much dispute between the burgesses of Cardiff and the surrounding county families. Cardiff experiences less rainfall than the average for Wales. Rain falls in Cardiff on 146 days during an average year, with total annual rainfall of 1,151.9 millimetres (45.35 in). Monthly rainfall pattern shows that from October to January average monthly rainfall in Cardiff exceeded 100 millimetres (3.9 in) each month, the wettest month being December with 125.3 millimetres (4.93 in). Cardiff's driest months are from April to June, with average monthly rainfall fairly consistent, at between 65 and 75 millimetres (2.6 and 3.0 in). 2017 figures from the Met Office now reveals Cardiff as the wettest city in Britain. Swansea used to be the wettest British city in recent history. Following the establishment of the city's first Welsh School (Ysgol Gymraeg Bryntaf) in the 1950s, Welsh has regained ground. Aided by Welsh-medium education and migration from other parts of Wales, there has been a significant increase in the number and percentage of Welsh speakers, with numbers doubling in the 20 years between the 1991 and 2011 censuses, from 18,071 (6.6%) to 36,735 (11.1%) residents aged three years and above. Cardiff City Council adopted a 5-year Welsh language strategy in 2017 in order to increase the number of Welsh speakers (aged 3+) in Cardiff by 15.9%, from 36,735 in 2011 to 42,584 residents by the 2021 Census. The LSOA (Lower Layer Super Output Area) with the highest percentage of Welsh speakers in the city-centre is found in Canton, at 25.5%. The LSOA with the highest percentage of Welsh speakers in the entirety of Cardiff is found in Whitchurch at 26%. A number of radio stations serve the city and are based in Cardiff, including Capital FM (South Wales), Heart (South and West Wales), BBC Radio Wales, BBC Radio Cymru, Nation Radio, Radio Cardiff, Smooth Radio (Wales) and Xpress Radio. 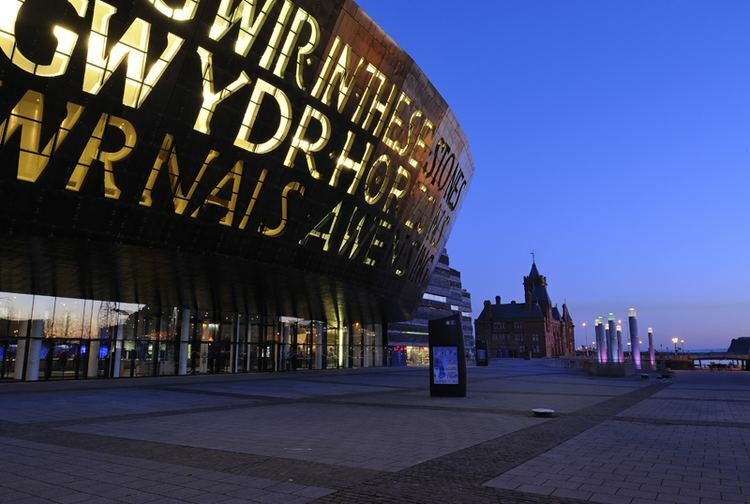 Many notable people have hailed from Cardiff, ranging from historical figures such as the 12th century Welsh leader Ifor Bach and to more recent figures such as Roald Dahl, Ken Follett, Griff Rhys Jones and the former Blue Peter presenter Gethin Jones. In particular, the city has been the birthplace of sports stars such as Tanni Grey-Thompson and Colin Jackson as well as many Premier League, Football League and international footballers, such as Craig Bellamy, Gareth Bale, Ryan Giggs, Joe Ledley, and former managers of the Wales national football team Terry Yorath and John Toshack. International rugby league players from Cardiff include Frank Whitcombe, Billy Boston, David Willicombe and Colin Dixon, and baseball internationals include George Whitcombe and Ted Peterson.